As we near the end of the semester, classes are almost over, and summer is right around the corner. But, between us and summer, are looming finals and the increasing dread of spending your days surrounded by highlighters, books and stacks of papers. While you weather the storm of exams, the Wisconsin Union is here to be a place for you to find fun and focus amidst the frenzy of finals. Twice a year, the Union holds Finals Frenzy. 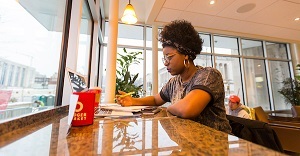 It’s a time the Wisconsin Union team fills with study breaks, giveaways, food and drink specials, and plenty of ways to keep finals from getting you frenzied. This year’s Finals Frenzy will go from April 30-May 9 and will include some of the community’s favorite exam week traditions, including #PennyPromotion. Not familiar with #PennyPromotion? It’s simple. Each day, from April 30-May 5, the Union team will announce a Union food or beverage item that you can purchase with your Wiscard for only a penny if you are a UW-Madison student. Promotions are not announced ahead of time. Follow the Union’s Twitter account @WisconsinUnion for your daily #PennyPromotion. As the semester winds down (and so do the available funds in our bank accounts), the Union’s #PennyPromotion couldn’t come at a better time. The Union and campus partners also have the programming to take the frenzy out of finals week. From petting dogs to a free tea party, your campus living has the study spots, caffeine, food and daily sources of fun to help you finish the year strong. Check out the full list of events at union.wisc.edu/finals-frenzy.